Bank of America swung to a loss in the first quarter. 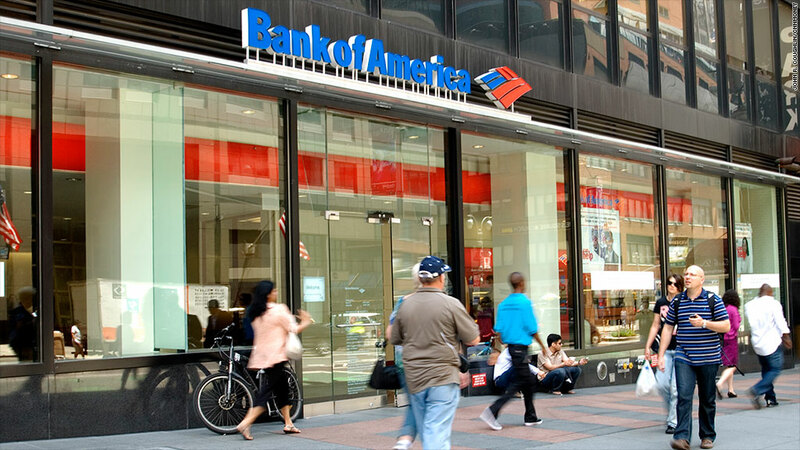 Bank of America reported a quarterly loss Wednesday as legal costs hit the bank's bottom line. It's another reminder that the tentacles of the financial crisis are still squeezing Wall Street. The nation's second largest bank by assets reported a net loss of $276 million, or five cents per share, in the first three months of 2014. That's down significantly from 10 cents per share from the same period last year. It looks as though the bank wanted to get as many of its legal woes sorted out as possible and take a hit all in one quarter. The loss reflects $6 billion in litigation expenses tied to legal costs, including Bank of America's recent settlement with the Federal Housing Finance Agency over mortgage-backed securities. The bank announced the $9.5 billion settlement in March. Bank of America also set aside another $2.4 billion for previously disclosed legal costs. "The cost of resolving more of our mortgage issues hurt out earnings this quarter,'" said CEO Brian Moynihan in a statement. But he said the bank "generated solid results" and added that it is returning excess capital to shareholders. The Federal Reserve recently approved Bank of America's plan to buy back $4 billion in shares and boost its quarterly dividend to 5 cents. Bank of America has been resolving various lawsuits stemming from the 2008 mortgage bust, many of which were inherited from Countrywide, the mortgage lender it bought in 2011. The bank also reached legal agreements with Financial Guaranty Insurance Co. and Bank of New York Mellon in the first quarter. Bank of America (BAC) shares fell over 3% in early trading. "We expect shares to sell off following today's result," analysts at Nomura Securities wrote in a note to clients. While revenue growth was in line with expectations, Nomura said the gains from fees came from "lower-quality areas," such as equity investments and debt gains. Excluding legal fees, which totaled 40 cents a share, Bank of America earned 35 cents per share in the first quarter. That topped analysts' expectations for earnings of 26 cents per share, according to FactSet. "We are obviously pleased to have this issue behind us," said Bruce Thompson, chief financial officer at Bank of America, referring to the settlement with FHFA. Bank of America said revenue in the quarter was $22.8 billion. Low interest rates continue to be a headwind for the financial sector, and Bank of America was no exception. Net interest income fell 5% in the quarter to just over $10 billion. Meanwhile, non-interest income was flat. Earnings from mortgage banking were weak and trading profits were down. But the bank reported gains in its investment and brokerage unit, along with profits from equity investments and the sale of certain debt securities. The bank does appear to be managing expenses well. Excluding all the legal fees and costs associated with pensions, non-interest expenses declined $1.2 billion in the quarter. Bank of America has been one of the top performing banks in the stock market this year. Even with Wednesday's decline, the stock is up more than 5% this year. Wells Fargo is the only other big U.S. bank stock that is in positive territory this year. The results came amid a mixed quarter for the banking industry. JPMorgan's (JPM) earnings disappointed investors last week, but investors cheered results from Citigroup (C) and Wells Fargo (WFC). Goldman Sachs (GS) and Morgan Stanley (MS) will report later this week.